This post may contain affiliate links. I may receive commissions for purchases made through links in this post. See my disclaimer. It’s not easy to hold down the fort for days, weeks, or months alone. Its exhausting going from having help to going long amounts of time without help. I give HUGE props to all the single parents out there -I do NOT know how you do it. My husband is a military pilot, and I love the Military, but he’s gone a lot. It’s not always easy to stay sane while your husband travels. He flies anywhere from 1-3 weeks a month plus he serves on 3-6 month deployments, and you can’t forget all the training trips. We never seem to know what’s our next day, week, or year will look like. Every military spouse has a different deployment (mission/tdys/etc) schedule – some are gone 9 months, some are gone 6 months. Honestly, it doesn’t matter. One day away from your spouse is hard. I have one rule that I follow to stay sane while my husband travels: I put my house back to Zero. I want to preface this with, I know that this isn’t for everyone. This is MY rule that I always follow to keep my sanity. Now I don’t want for you to think of this as a chores list – even though that’s what it looks like – this list is the list that will start your next day off right. If my day starts off right, the rest of the day tends to go well. Above, you see my version of zero. I want you to pay attention to your moods, your surroundings, and your habits. Let’s figure out what zero looks for you – and stay sane while your husband travels. What makes you happy and relaxed? What do you dread looking at? What makes you feel out-of-control or in-control? Make a list of things of these things. Don’t make a crazy long list. It should include just the very basics to keep you sane. Notice that my list does not include laundry – I hate laundry. It didn’t make the list because I know that I’m not going to fold laundry even if it’s on my list. Sometimes, when the husband flies, we live on clean clothes straight out of the dryer. And yes, I commonly have to re-run the dryer to freshen up the load. I’ve accepted that! Some people, however, will leave dishes off the list but put laundry on the list. Everyone’s “zero list” will look different. Items on your list do not have to be chores either. Do you feel in-control if you start off every day with a run or yoga? I want you to become aware of your needs and commit to meeting those needs. Now go experiment with your Zero List! Make a list and then commit to following through. If it didn’t help, try a modified list the next trip! You’ll find your Zero. Let go of the pressure you put on yourself. The kid will be just fine with mac and cheese or pizza tonight – I promise. (And this is from someone whose blog is mostly about healthy living and essential oils). Get a babysitter every once in a while or on a regular basis! It’s OKAY to get a break or go grocery shopping by yourself. Use Essential Oils to help manage your moods – I love the Happy Mama Blend. Consider hiring a maid once a month or a lawn service. Get a meal plan service! I know lots of pilot/military wives that use meal services like Hello Fresh (this link gets your $40 off your first delivery). Have that glass of wine. Share with me! What makes your Zero List? What keeps you sane while your husband travels? I wish I had gotten this advise 25 years ago. No way! That’s so neat! Did it help to keep you sane? 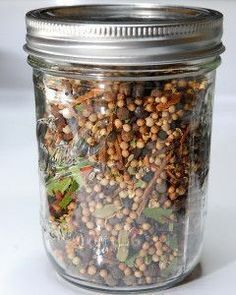 Don't buy pickling spice blends, make your own, it's easy!